Every so often we get a really lovely opportunity to review something really special and, when we were chosen to review the Hape Discovery Space Centre for Izziwizzi Kids Play Fest, I was more than a little excited! We love wooden toys in our house and Hape are a favourite brand of ours. They have innovative designs and, in their play sets, offer some wonderful opportunities for creative, imaginative role play. The Hape Discovery Space Centre arrives in a large box with a carry handle displaying the trademark Hape branding. The toy requires assembly, we decided to keep it well away from the children as there are some very small pieces. This meant that, when Bud was introduced to the toy he received the full 'wow' factor rather than hanging over us waiting for the toy to be built. The box says that 39 pieces are included. Now, I'm not sure where this figure comes from as there isn't a full contents list but there actually a few more than 39 in there! The main rocket body is made up of three large wooden fins and four floors, with a central lift. It's really easy to assemble with six screws that secure the rocket at top and bottom. In addition to this there is the landing module which also forms the nose cone of the main rocket, two astronauts, an alien, a robot, eight pieces of lab equipment, a flag, a piece of the moon's landscape, a folding solar panel landing pad, a truck with two tanks, a bed, a treadmill and various cord 'hoses', 'tools' and tiles for the astronauts to investigate. Hape have really thought of everything for a small boy to play with in the Discovery Space Centre. Bud is three years and five months at the time of writing and, while we have discussed space and he has a few books which talk about aliens and rockets, I was really impressed by his knowledge. On seeing the rocket he immediately started putting all of his space vocabulary to good use and telling stories about what was happening with the 'space man' and 'space girl' and the alien. 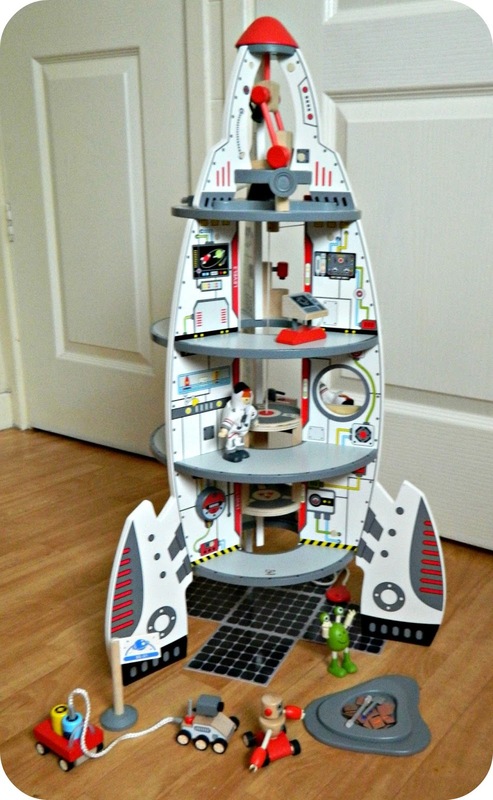 He knew that the rocket would blast off and land on a planet, or the moon and that the astronauts would have to wear their space suits and helmets to go outside, demonstrating the role play capabilities of this toy. The only things that remotely confused him were the truck and he asked 'what's a car doing in space?' and the tiles which he quickly decided were space treasure for the astronauts to dig up. As we played with him he soon started to pick up on new vocabulary like 'lunar rover', 'oxygen tanks' and 'solar panels' and we could tell that his understanding was increasing too. It's fantastic to see him playing in such a creative, imaginative way and this toy is really drawing that out in him. The rocket has a few small, fiddly components which Bud has enjoyed getting to grips with. Connecting hoses between different play pieces is quite tricky for a three year old but it's clear that he is really determined to ensure he does it, great for improving his fine motor skills. There are also lots of little nooks and crannies, like a rack to store the spade in, or windows to pass things through, in addition to the winch which is used to raise and lower the elevator up and down the space centre. Within a few minutes of playing with the toy it was interesting to see how this skill, especially, improved. The Hape Discovery Space Centre is a beautiful toy. It's large, I would say over a metre in height and it will look wonderful on display in Bud's bedroom. The wood is finished to the highest quality and the painted finish is intricately detailed and great looking. All Hape toys are made from FSC certified wood so you can buy with confidence. The toy is aimed at age 3+ and I would say this is definitely accurate. There are many small pieces that would represent a choking hazard and, simply in understanding, I feel that a younger child really wouldn't be able to engage with this toy in an appropriate way. I think the optimum age for this would probably be from three to around six. Buy it at the correct time and your child could get a few years of enjoyment from it. 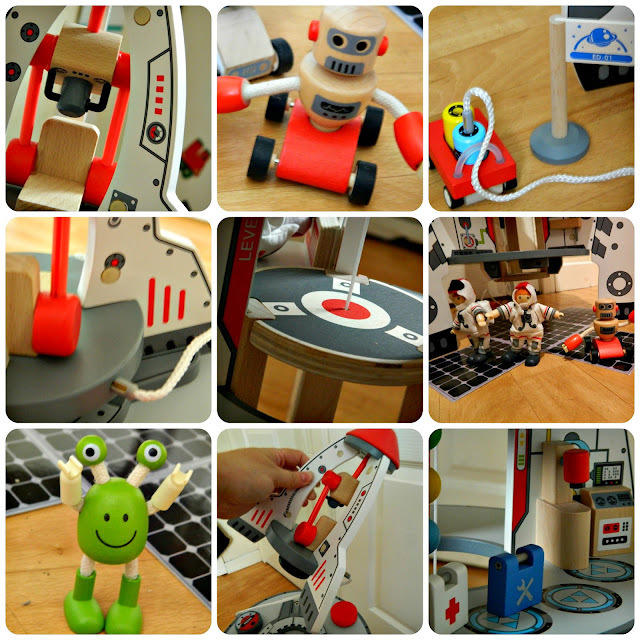 I have a video review of Bud playing with the Hape Discovery Space Centre, you can see just how much he loves it here. 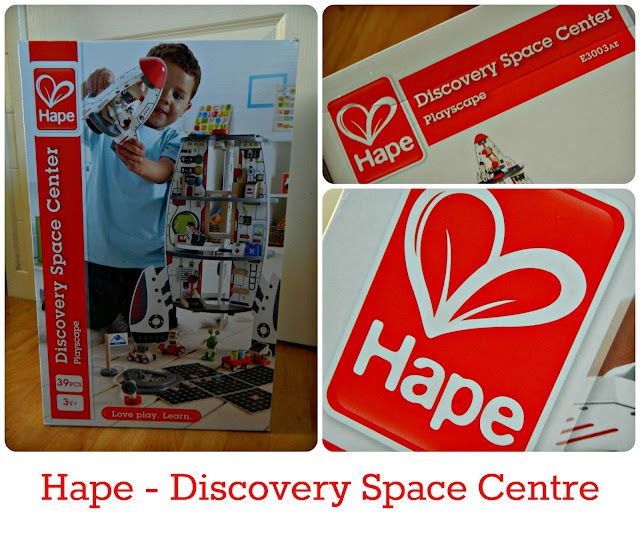 You can purchase the Hape Discovery Space Centre from Amazon and other good toy retailers. It retails at an RRP of £105 but, for a wonderful toy I think it is really excellent value. It has been played with on a daily basis since it arrived in our house and I feel confident that this will continue going forward. We really love the rocket and Bud is over the moon with it! Disclosure: We are Toy Testers for Izziwizzi Kids Play Fest and received this toy free of charge in return for producing a video review.